There I was one sleepless night cruising through YouTube videos and I happened across a subject that caught my eye - making your own acrylic thinner. For years I used Isopropyl Alcohol (99%) that you can find inexpensively in drug stores, but this required serious ventilation as the alcohol vapor can get absorbed quickly into your bloodstream as you breath it (not good). I've had really great results using alcohol as an acrylic thinner for paints from Tamiya, Gunze Sangyo (Aqueous/Mr.Hobby), Vallejo, Italeri, and Akan (don't try this with Testors Acryl, it took some time to clean the resulting goo from my airbrush). Using alcohol was okay when I was single, but using alcohol today will get some less-than-polite feedback from my wife. I've discussed this with some knowledgeable folks who thin their acrylics with water (or windshield washer fluid). The few times I've tried water were enough to keep me on the alcohol path (sounds like W.C. Fields, doesn't it?). I've been using Tamiya acrylic thinner which has worked fine to date (except for Testors Acryl) but between price and availability, it was becoming a problem. That's when I saw this YouTube video from Genessis Models in the UK. He recommends an interesting mixture that merited a test. The gentleman in the video recommended a mix of 33% alcohol to 67% distilled water. Distilled water doesn't have the contaminants/additives found in tap water or well water. 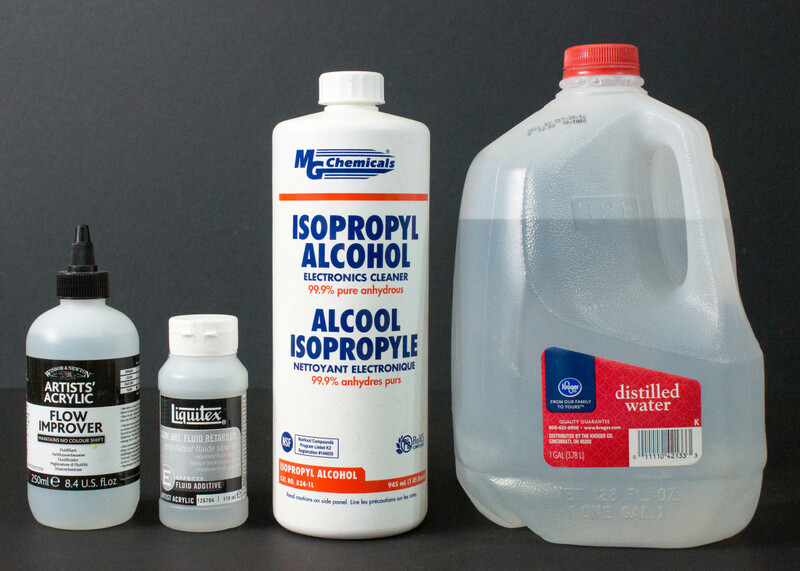 I use 99.9% Isopropyl Alcohol as the lesser strength alcohols are not as effective (according to the folks that taught me the alcohol approach years ago) and is likewise recommended in the video. The third ingredient is a few drops of Acrylic Flow Improver to remove surface tension of the fluid (you might have heard of folks using a drop of dish soap for the same purpose). The final ingredient is Acrylic Fluid Retarder which slows down the drying time of acrylics and keeps your paint in fluid form when it hits the model and doesn't dry at the airbrush tip or in the air enroute to the model. I made up a mixture of water and alcohol using the proportions above, then added around 10 ml of Flow Improver and 10 ml of Fluid Retarder for this test batch. With a recent test build, I used Tamiya, Italeri (Vallejo), Gunze Sangyo Aqueous (Mr.Hobby) and Akan acrylics, all thinned with this mixture. The paint responded extremely well out of my airbrush. I did try a few shots of acrylics straight out of their bottles to see the difference in performance. There was indeed a difference! The resulting thinner mixture smells about the same as Tamiya's thinner and while you'll still want to use some ventilation, this thinner is far more family friendly than pure alcohol and more effective (for me at least) than pure water. The best part is that you can adjust the proportions of each of the four ingredients until you find that perfect mix. I didn't try using this mixture for airbrush cleanup as I use Windex window cleaner with ammonia for that job. The Windex doesn't thin the acrylics, it dissolves them and running Windex through the airbrush doesn't leave any foul smells (but if your spouse does ask about the smell, tell her you're cleaning your room). So what about costs? A gallon of distilled water will run you around $1 USD at the supermarket. 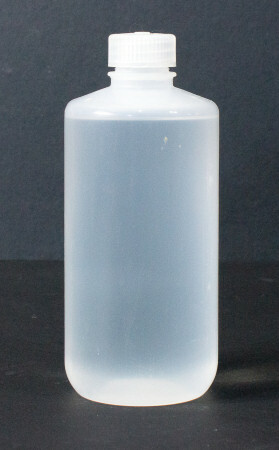 99.9% Isopropyl Alchohol can be found for around $3 USD/pint (473 ml). I tried to find the Acrylic Flow Improver and Fluid Retarder at the local art supply stores but I wound up ordering them from Amazon. The Flow Improver cost about $12 USD for 250 ml and the Fluid Retarder about $10 USD for 118 ml. I used a 500 ml bottle for my mixture and calculating the costs of materials, it cost about $2.65 USD to mix 500 ml and I have ample fluids to make more batches. Contrast this with a 250 ml bottle of Tamiya X20A thinner for almost $9.00 USD.